Penn and Teller Get Killed. Lorimar Film Entertainment 1989. I’m not entirely sure when I first encountered Penn and Teller. I clearly remember that my seventh grade science teacher, who was a magician himself, showed us some tapes of televised magic acts, and there was at least one Penn and Teller illusion in the bunch. They appeared on an episode of Home Improvement, though I don’t know if I recognized them when I was regularly watching that show. I knew them well enough when they released “Off The Deep End” in 2005 I made an effort to tape it myself. So I would conservatively say I knew of them by the early 2000s and had seen their work from as early as the mid-90s. But when I discovered “Fool Us!”, I went looking for a list of their old specials and series, and discovered one that was pretty different from the others. Magic isn’t exactly unscripted, and it may tell a story, but here, among all these magic shows, was, nearly at the beginning of their career, a theatrical, scripted/narrative film where they play themselves. It’s perfect for them, but how did this even happen? Comedians, debunkers, “Bad Boys of Magic” Penn and Teller love to prank each other in their spare time. Though they get pretty riled up, there’s never any hard feelings when the joke is revealed. Also involved in the pranks is Carlotta, who is kind of their agent or manager and kind of Penn’s girlfriend, but I’m not sure that’s really made explicit. Those pranks escalate from tying each other up in airport security (if the state of flying was then what it is now, they’d still be in jail today) to some stunts that seem like real peril. 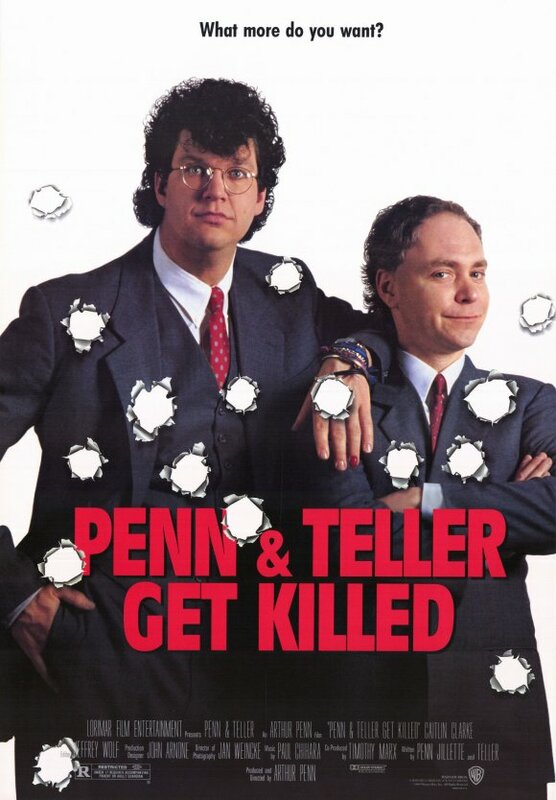 Then Penn gets shot in the arm and accuses Teller of hiring a sniper to take potshots at him, but Teller is completely innocent, and after a few more attempts, it becomes clear this isn’t a joke. There must be a real killer out to get Penn, just the excitement he wished for on national TV the other day. They’ve been maverick, anti-establishment, fresh-idea magicians from the beginning (what drew me to them was how they’re so intent on making it clear they’re fooling the audience that they’ll show how they do a lot of their tricks), but they look so young in things from the 80s/early 90s. Maybe it’s mostly the hair, but Penn hasn’t adopted his beard yet and even spends a surprising amount of time without his glasses, which makes him look even younger. Teller has more and longer hair and that’s about it. They also seem to get up to more energetic stunts than they were doing by the late 90s/2000s, but that’s somewhat expected. It’s been part of Teller’s act that he doesn’t speak since before he partnered with Penn. It’s a shtick that’s designed to make people pay more attention to what he’s doing, but it’s become his identity, at least on stage. And to that end, there are a number of situations in this movie where he’s not, within the narrative, performing, and so ought to be able to speak, except he really is performing, so the gimmick is preserved. There are actually quite a lot of times it’s justified. Sometimes he just doesn’t need to say anything to get a point across (which he’s very practiced at anyway), sometimes he can’t get a word in over someone else, and sometimes it’s in service of a prank, but most of the time, he’s just being a quiet person, which is a behavior I recognize because I’m typically a quiet person myself, but isn’t seen on screen much since sound came to cinema. There aren’t many times it doesn’t seem justifiable, but there are a few. The end goes out of its way to defy expectations. I think the main reason it goes on for so long is to build anticipation that isn’t going to be rewarded, but it also just becomes its own overly long gag that’s actually funny, though I usually don’t like when the joke is just that something’s being drawn out to ridiculous levels. There are a lot of twists I appreciated that I hope I’ve been able to comment on without giving it away. Like a magic act, a story is more satisfying when you either figure it out for yourself or, as in a Penn and Teller show, the trick may be revealed only after you’ve been given the appropriate amount of pieces.